Stupidity From The Right | Holy Hell! With Republican leaders like this, it’s no wonder Colorado has been lost to the Democrats. A prominent GOP lawmaker has gone rogue and will attempt to do away with a decades-old spending limit without any support from his party, the top House Republican said Wednesday. According to Marostica, May came under pressure from conservatives including Independence Institute President Jon Caldara and former state Treasurer Mark Hillman to oppose the bill and called Marostica in for two meetings Tuesday. He denied that May threatened to yank him from his position on the powerful Joint Budget Committee if he didn’t drop the bill, but he said he was told that GOP Senate leaders were furious. "There’s great concern whenever you’re in a leadership position (like Marostica) and this happens," May said. "To head off without the rest of your troops is not a wise action." Marostica acknowledged that he might not get support from another legislative Republican but said he’s going to move ahead with the bill. He questioned why May was taking advice from people like Caldara and Hillman. "They’re has-beens. They’re losers," Marostica said. Colorado district 51, this man should not be re-elected and those of you in his district need to contact him to let him know you will not be voting for him. Notice the “Promise Made” on this screen capture from his web site. Rep. Don Marostica will apologize to Republican leaders he called "losers" and "has-beens" but will push forward with a spending bill that has turned some in his caucus against him. Now, lets get down to business and spend some more money! 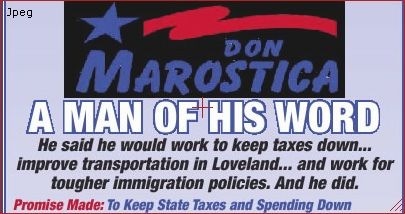 If nothing else Rep. Marostica has made it clear where he stands”. Come re-election time I hope we will not have forgotten this and will tell him where we would like him to go. We all knew the pardoning of the turkey’s was coming, it happens prior to every Thanksgiving. It’s cute, it’s nice… whatever. The time for Presidential pardons however is growing short and Mr. Bush has yet to pardon wrongly convicted border patrols agents Ignacio Ramos and Jose Compean. The purpose of the Presidential pardon is to redress injustice; the Presidential pardon may well be the last best hope that these two men who protected our borders might have for justice. The lives of these two men and their families have been forever changed because they performed their jobs. That these men were convicted is a tragedy, everyday that passes without the pardon of President Bush adds to the injustice. These pardons should have been carried out long ago. Think you know the story? If you have heard it from the MSM’s then you do not know the story at all. Kanof acted swiftly, handing out immunities to anybody who would testify against Ramos or Compean. She also provided the drug smuggler with free medical attention at William Beaumont Army Hospital in El Paso and free passage back and forth between the U.S. and Mexico, not bad treatment for an illegal alien and known drug smuggler. Kanof alleged that the smuggler was an innocent person who was shot by the agents as he ran away from them, fearing the agents were trying to beat him up. The details. With Ramos and Compean in hot pursuit of this drug smuggler, Davila was forced to ditch his van loaded with 743 lbs of marijuana. In attempting to escape, Davila assaulted and cut BP agent Jose Alonso Compean and left him on the ground bleeding. While Compean was chasing Davila on foot, Ramos had been trying to outflank Davila to cut off his escape into Mexico. Hearing gun shots and calls for help from his fellow agent, Ramos raced to the scene and found Compean on the ground bleeding. He saw Davila racing towards the Rio Grande, about to cross into Mexico and escape. Agent Ramos began to chase after the smuggler who had just assaulted his fellow officer. Then the smuggler turned and pointed something at Ramos that he believed was a gun. The time was approximately 1:15pm. It was broad daylight. Ramos, fearing for his life and believing that Davila had already been shooting at his fellow officer, took a single shot at the smuggler. At this time, nobody knew that the smuggler had been wounded. The smuggler turned back towards the border and kept running. He disappeared into the tall, thick brush along the river. Later, Davila was spotted running across the dry river bed and jumping into a waiting vehicle with two other suspects. This was witnessed by four Border Patrol agents, documenting that Davila was not some “innocent” illegal alien, but a bona fide drug smuggling operation. The three smugglers took off and the agents walked back to the abandoned van where they discovered the 743 pounds of marijuana. BP supervisor, Jonathan Richards, who had arrived on the scene, was very angry that the smuggler had gotten away. Richards ordered everyone to report to the station. He also told them to load the 743 lbs of marijuana onto their vehicles and take it to the station. Richards never went across the canal to investigate the assault or to check on agent Compean. Ramos and another agent, named Yrigoyen later testified they told Richards that Compean had been assaulted. At the station, another agent, Mendez, stated that Compean had cuts on his face and hand. He said this in the presence of Supervisor Richards. This is significant because Richards denied having any knowledge of Compean’s injuries. The BP supervisor lied on the witness stand, testifying that no one told him Compean had been assaulted, which is his excuse for never notifying the F.B.I. of this fact. The truth is that he offered Compean medical attention and had asked Compean several times if he was OK. The physical evidence was apparent as Compean was cut and covered with dirt. Richard’s failure to notify the F.B.I. of the assault is the reason why the case was never investigated. Because of the supervisor’s actions, none of the agent’s filled out firearms discharge reports. This administrative policy violation calls for a five day suspension without pay. After checking again on Compean’s condition and asking him if he wanted to file assault charges, according to testimony, Richards then made a statement saying, “If we call the F.B.I. we are going to be here all night doing paperwork. We will never know who the person was that assaulted you although we’ve got the van and the marijuana.” After than, everyone went back to work. The Arrest. In a dramatic display of overkill, the two BP agents, Ramos and Compean, were arrested by SWAT teams, armed with automatic weapons, at their homes. They were roughed up by the arresting officers before handcuffing them. And all of this was done in front of their families, including their young children. I understand that most of us who make a claim to conservatism are sane, but we have our nutters just as the left has theirs. There are a number of groups on Facebook that have popped up calling for the impeachment of Barack Obama. The man hasn’t even taken office as of yet. This nothing more than hysteria and I hate to say it, hate. We should be in prayer for this man who will lead this nation. We should pray that God will lead him. I want Barack Obama to be successful as president, because I want successful leaders for this nation. I define success differently than he does which in order for him to meet my definition of success would mean his whole agenda would have to change. But you never know what God may do with his heart. I WILL NOT be a part of anything which hopes for the failure of a U.S. President. I expect failure from him, but I do not seek it and I believe anyone who does seek it does not have the best interest of the nation at heart. I expect Barack Obama to screw this nation up and bring us a Euro centric type of Socialism. I expect he will not veto any legislation to bring back the Fairness Doctrine, I expect him to keep his promise and make one of the first things he does is to sign the Freedom of Choice Act. Those things are beyond offensive, but they are not impeachable offenses. He also, being only president elect, has not done anything impeachable. He may once in office and if so then we should pressure for his impeachment. But then that should be done to any president of the right or left who does something impeachable. The stupidity is astounding and is no way to unite Republicans (Democrat light) let alone moved forward with a forward with an effective Conservative movement. Leave the dramatics and hysteria to those who are best at it, the Left. I am not a fan of Barack Obama, I think his being president of these United States will be very detrimental , but weather I like or not and weather any given individual likes it or not he will be the next president. I personally do not want to hear “he isn’t my president”, he is my president unless I relinquish my citizenship. He is your president as well unless you relinquish your citizenship. This does not mean I am going to support him in anything and everything, I suspect I will support him in next to nothing if in anything at all. But it is not in the interest of the right or of the nation to attack him based upon nothing. Do you want to be the equivalent of the moonbats who were constantly attacking Mr. Bush? Those fools kept the nation divided and many things did not get done because of them. Ed Morrissey of Hot Air posted an article today about the passing of Barack Obama’s grandmother, Madelyn Dunham. The article notes that Barack made the right choice in taking some time from the trail to visit his grandmother and that he is making the right choice now in his decision to to continue the campaign given the short amount of time left. Sadly, some of those who left comments do not have the tact and compassion that Mr. Morrissey does. I do not trust Barack Obama in anyway. I believe he, if elected, will be disastrous for this nation. I in fact believe the man has proven himself to be deceitful and a liar. All of that said, some of the comments left on Hot Air regarding the passing of Mr. Obama’s grandmother are far beyond being over the top. I understand why Hot Air left the comments up. It is, in my opinion, good practice to allow the ignorant to expose themselves. Some of the comments suggest that the death of Obama’s grandmother is a political ploy. May those posters not have to experience such a lack of compassion when they next have a loved one pass. Hot Air added and update to the article directed specifically at the over the top comments given by some. Those commenters “questioning the timing” need to get a life. Those wishing ill on Senator Obama or his family (in the past or present day) will find their comments deleted. Get classy and stay that way, please. My own prayers have been said for Mr. Obama and his family. That they may experience the comforting of Christ in this time and that if any in the family do not know Jesus Christ that the death of their loved one may be a event which leads them to Him.